Once, while Chet Atkins was alive and well, I introduced him at a function this way: "Ladies and gentlemen, the late, great Chet Atkins." I was MC that night at a special tribute to BMI chief Frances Preston, being held at a fancy ballroom here in Nashville. Chet was among several artists there to perform and say nice things about Frances. It was early January 1995. A few days earlier, I had been watching one of those year-end features on TV where they scroll the names of famous people who died during the year just ended (1994). As I watched the sad list of names roll by.... suddenly, there on the screen -- to my absolute surprise -- the name Chet Atkins. I was shocked. How did I miss this? Why hadn't someone told me? I knew Chet was scheduled to appear at the Frances Preston dinner..... yet, somehow, I had missed the news that Chet had passed away. Maybe he died last night, I thought. Otherwise I felt certain someone would have called me. I called a friend. Had he known Chet Atkins was dead, I wondered? "No, absolutely not, it's not true", he said. "But I just saw his name scroll by on the list of celebrities who died in 1994", I answered. Well, later that day, the network acknowledged their mistake. Whoever was typing the list had confused the name Claude Akens, the character actor, who had indeed died that year. 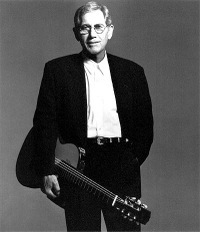 It had been mistakenly typed Chet Atkins, instead of Claude Akens. 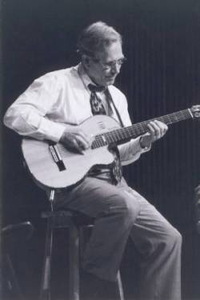 A few days later, on the night of the dinner, after I introduced "the late, great Chet Atkins", Chet meandered up to the microphone, and said: "Yeah, a lot of people have been telling me they heard I was dead, but I'm here tonight anyhow." Chet was a funny man who told wonderful stories. He always liked to joke that he had a swimming pool shaped like a guitar amplifier. And he liked to say, "By the time I learned I couldn't tune a guitar very well, I was too rich to care." Chet was around for another five-and-a half years after that dinner. But on June 30, 2001.... four years ago.... he died for real. Once, back in the 1980s, when I interviewed Chet, he picked up his acoustic guitar -- and there, sitting not more than 5 feet from me -- he cast a spell over me and everyone in the studio by playing "Vincent", the stunning song he often played to close his shows. That's something you don't forget. "Years from now, after I'm gone, someone will listen to what I've done and know I was here. They may not know or care who I was, but they'll hear my guitars speaking for me."